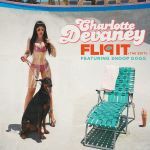 When it's just Snoop it's actually a somewhat impressive feat of being simultaneously dull and annoying in large doses, but then when that Charlotte creature starts in, the obnoxious factor ramps up and dull has to take a backseat to annoying. This is horrible. The production is actually pretty good, but the rest is quite a potential trainwreck. Not great, but not entirely bad. It's completely inoffensive and definitely not the type of track to take seriously. Although, my biggest grievance with it is Snoop Dogg's feature. He will literally collaborate with anybody, won't he? Snoops still relevant? It's 2015 FFS!!! 2.6. One of my greatest struggles in life is that when conversing with someone who doesn't know the pop charts like the back of the hand, and that person says something to the effect of '*verb* it', not to rhythmically retort back with a line of this song.<br><br>This song fascinates me, though probably not in a good way. It feels like something that could have been a hit 5 years ago, but even then I feel there were higher standards around. What I'm trying to say is that this song is just remarkably amateurish which sticks out in a big way next to...really anything else on the charts. I'm not convinced there's much more than 30 seconds of unique content in this. The very least she could have done was put her thang down, flip it & reverse it. It's a pretty laughable effort but it's not that bad. I can't really get mad at it, because it did seem to disappear from the chart and general existence very quickly before it managed to annoy at all. I suppose the production isn't too bad, and I agree with savage's recent comparison to Luciana. Perhaps overachieved in the chart but as 2016 proved, there was much worse to come.